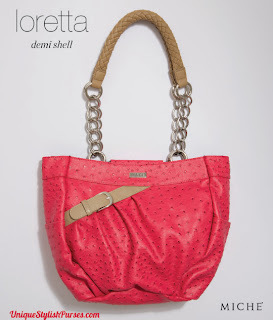 This joyful Loretta Shell for Demi Miche Bags evokes good times, laughter and happiness. Bright salmon pink ostrich faux leather is complemented by a plucky tan faux belt with silver buckle. Carrying Loretta will instantly brighten your day and liven up any neutral casual outfit. Side pockets. Streamlined design with oval bottom.